Recycle Montana, Inc. is a 501 (c) (3) nonprofit with federal tax identification number 20-5566183. The mission of Recycle Montana is “to educate Montana citizens and businesses about waste reduction, offer statewide recycling resources, and provide support to community efforts.” Your membership allows us to share statewide recycling news, locations and efforts on this website and Facebook, connect recyclers in Montana, gain the latest and greatest information on recycling and provide recycling education across the state. Members have access to technical assistance materials and information on various recycling programs. Please take the time today to join Recycle Montana. Download our membership flyer here. • Publications – Share local and state news in recycling through social media, our website, and periodic newsletter. Recycling news articles, referrals to people and organizations who may be able to help and recycling websites of interest. • Networking & Updates – Provides a connection to recyclers and recycling locations, local and statewide recycling trends and state policy to keep you up-to-date on the latest recycling trends. • Education & Outreach – Promotes the activities and accomplishments of its members and supports educational opportunities across Montana for businesses, residents and schools. • Recycling Support – Consultation about recycling issues in your community or business, i.e. how to increase recycling, start a recycling program. • Annual Meeting – Members enjoy networking opportunities, annual updates of programs and services and voting privileges on matters brought to the meeting by the Recycle Montana Board. Opportunity to participate on the Board of Directors for selected members. Merchandise – Anyone donating $50 or more will receive a free re-usable produce bag while supplies last! Want more information? Please contact Executive Director, Kirk Treece at (406)880-2191. After completing this form you will be redirected to PayPal for your online payment. If you’d prefer to pay by check our mailing address is PO Box 5191, Missoula MT 59806. Thank you! 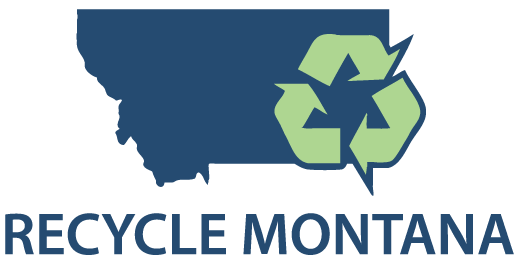 The success of Recycle Montana is made possible through memberships like yours. Together we can help more Montana communities and businesses through recycling education and assistance.